This document will give you overview of the main screen of the Configure.IT and related basic configurations. This helps you in understanding the platform better. We recommend to read this as well as basic overview of Admin Panel before starting working on Configure.IT. It will make the learning curve easy for either layman or technical person. Remember Me: If you want your password and username saved on your device then check this option. Forgot Password? : In any case, if you forget your password, you can always recover by clicking this option. This will redirect you on screen where you need to enter your registered email address and reset password instructions will be sent to you in email. 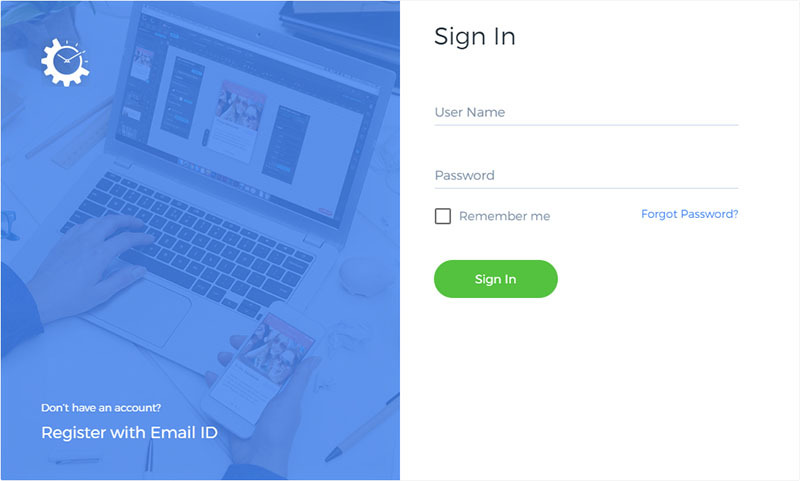 Check your email address, click on link, enter new password, enter again to confirm and clicking on button “Reset Password” will save your new password which you can use to login thenafter. Home: Clicking on “Home” will redirect on dashboard home page. Projects: Shows overview of projects. Billing: Shows current plan and other billing related options. Support: Outlines Tickets of the user and its status. Profile: Used to edit the profile. Notifications: Any Alert or Notification from Configure.IT will be shown. All: This lists all projects either they are Active or Archive. Gives summary of all the existing project as well a quick option to create new project under this heading. 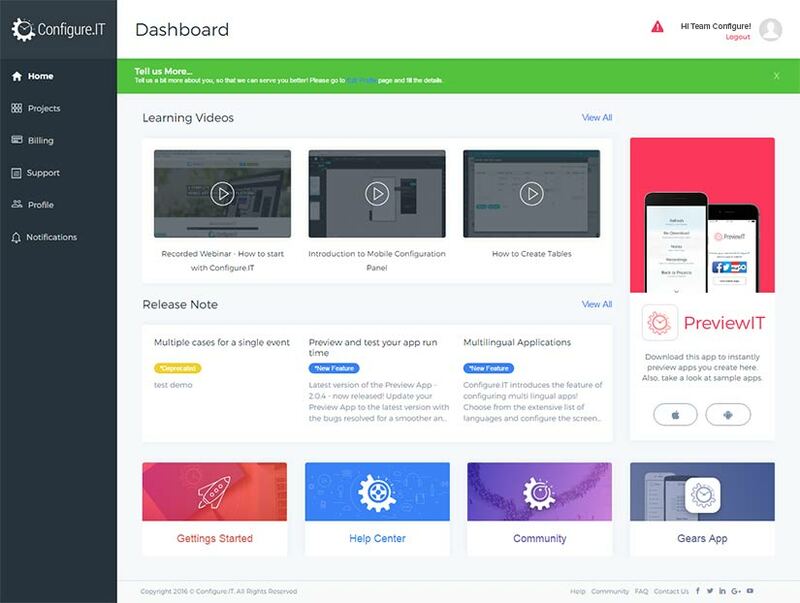 Hovering cursor on any project will give you basic overview of the App along with options to directly land either on App Console or Backend. Clicking on “App Console” will redirect user to view front end configurations whereas clicking on “Backend” will show database and API related configurations. 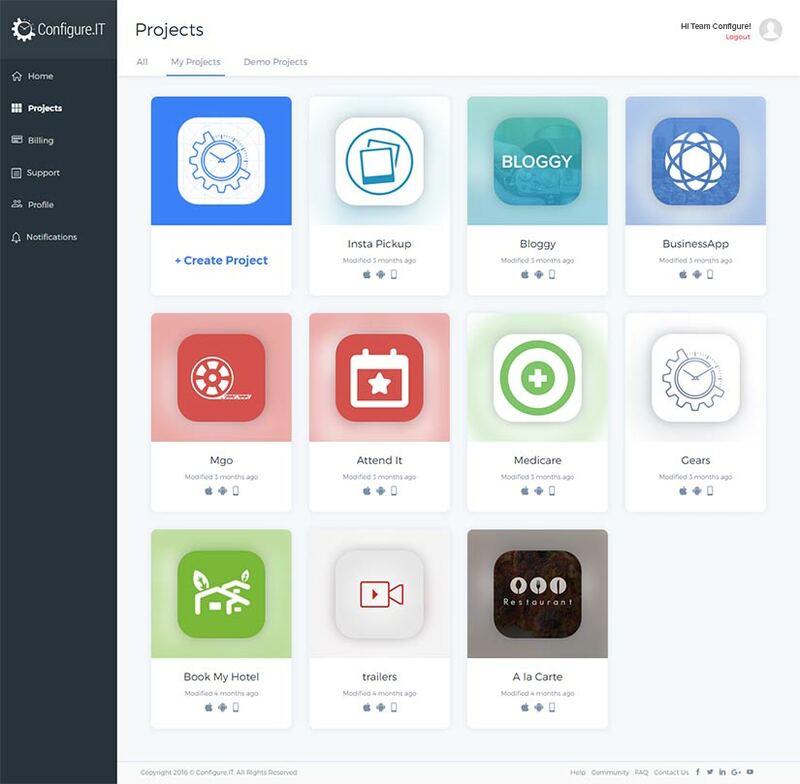 Clicking on “Project Info” will show overview of the project along with different options like Info, Backend, Builds, Back-end Deploy, Download and Preview.IT. This page shows summarized information of the selected project as below. App Name: is highlighted in top left corner. Either Project Information or App Screens can be edited. The Info page lists all the screens of the particular project. You can select any screen to edit it. Alternatively, you can filter the screens using platform too. 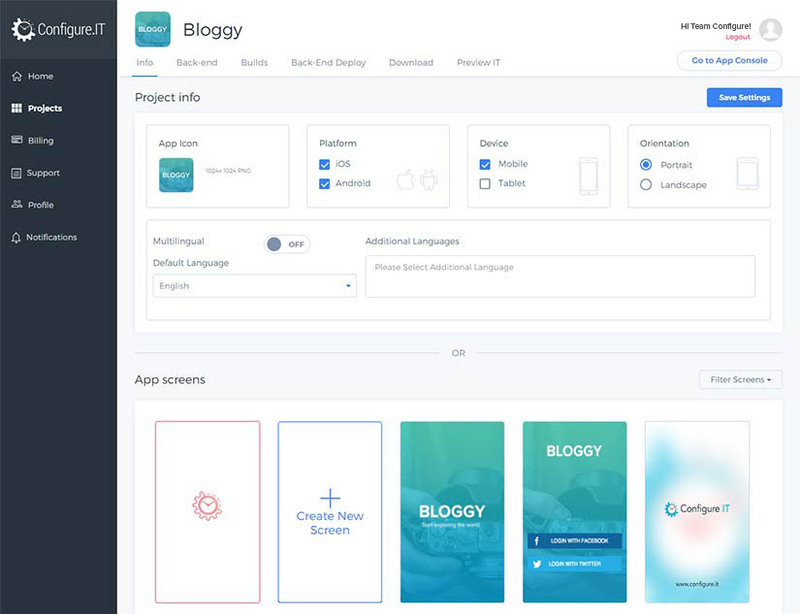 It presents Database Engine used for the App, no of tables, modules and APIs used in the project along with Menu style (Left or Right) and if the App is with local data or not. User can switch to Database, APIBuilder or DataPanel (Admin Panel) directly from here by pressing “Configure” button for respected tabs. Refreshing APIs or Data Panel can also be done from here. To get redirected on Back-end Dashboard, click on “Go To Back End”. This gives both platform build information. For iOS, it exhibits Project Name, Project ID, Bundle ID, Version, View / Upload Certificate, Certificate Password, View / Upload Provisional Profile and last version. Click “Save” to save any changes done and “Request IPA” to request IPA of the App. 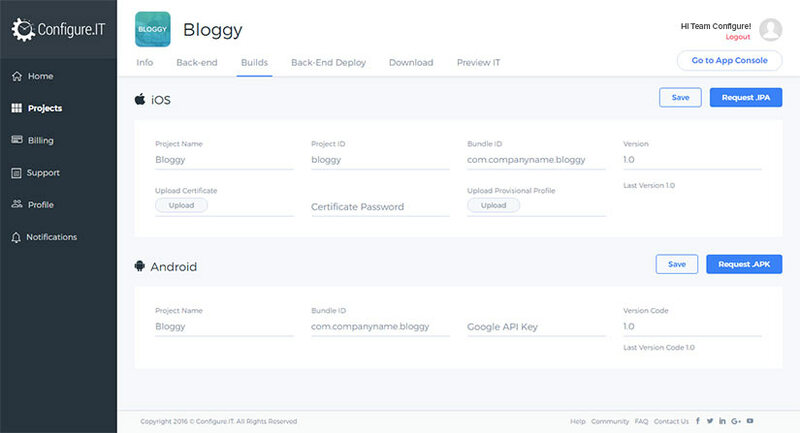 For Android, it displays Project Name, Bundle ID, Google API Key and Version Code. Click “Save” to save any changes done and “Request APK” to request APK of the App. It shows all the necessary information for deployment of the App. Configure.IT Hosting: Default is OFF. If Configure.IT Hosting service is subscribed then it will be ON and the base URL of the hosting will be displayed there. Manage Remote Servers: It lists all the Remote Servers available to deploy the Back-end. Select the server on which you want to manage this App back-end. Server URL will be displayed there to access. This could be user’s development server or real production server. Deploy to Remote Servers: User can deploy the back-end either on Remote Server or Configure.IT Server. If Remote Server is there then FTP information and DB Access will be needed. DataPanel Preview (Development Mode): It shows development URL and username & password to access the development URL. Clicking on “Login” button will redirect user on Admin panel Preview. 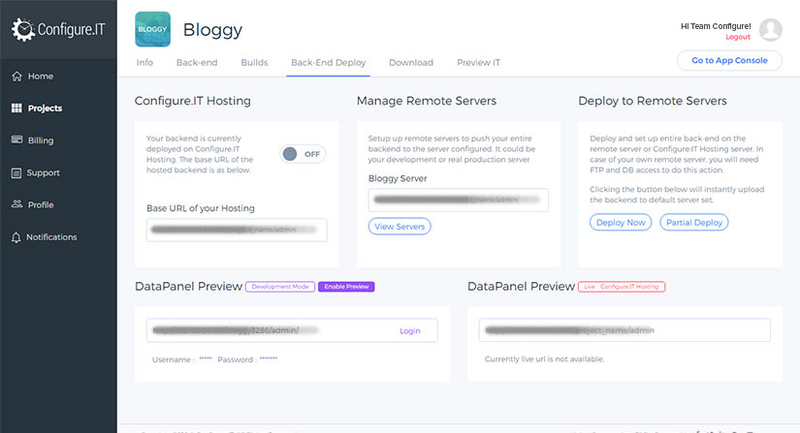 DataPanel Preview (Live): Live URL of either Configure.IT hosting or Remote Server will be shown here. Source Code of the App can be downloaded from this page. Source code download is a paid feature. Please refer to http://www.configure.it/pricing for latest pricing. 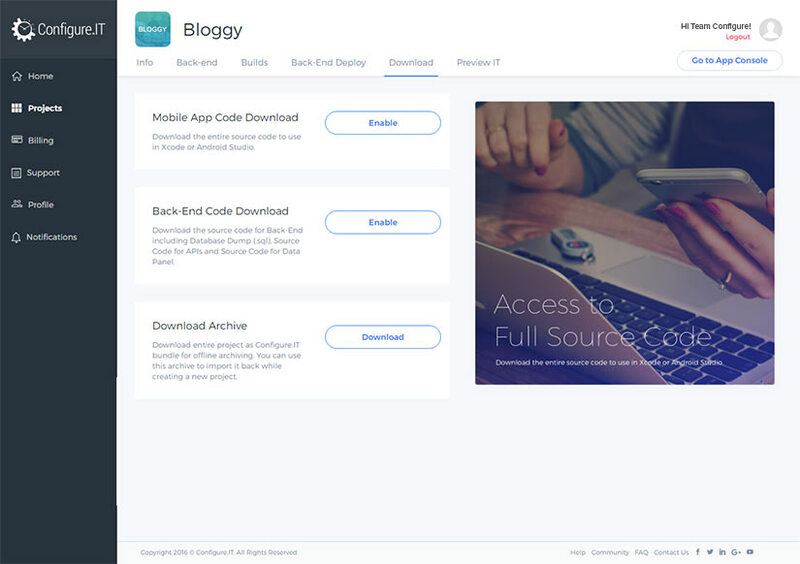 User can download either full source code of the App or only Back-end code can be downloaded to be used for Web App Development. Once user has paid for Source Code Download feature, it can be downloaded N times. Once the payment is completed, Click on “Enable” to enable to feature of download. It provides link to view video of “How to use PreviewIT App”. PreviewIT App is available on App Store as well as Google Play Store. 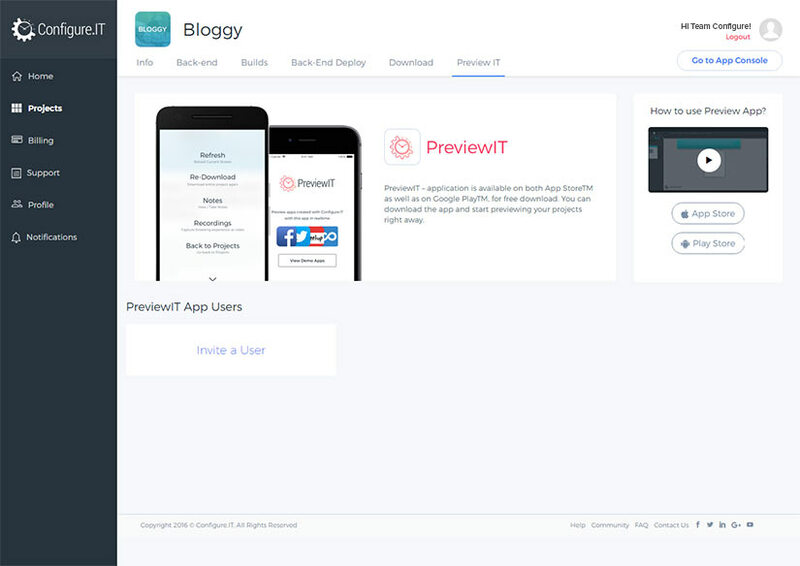 Clicking on respected buttons on the right side will redirect you to download PreviewIT App to preview the developed App. Invite a User: User can anytime invite a user to preview the App developed by him. To send invite, user needs to supply Full Name, Email address and Message for the invitee. Clicking on “Send Invitation” will send invitation email to the invitee with link to view the app. Lists all the templates or ready made Apps developed by our developers community, shared for the demonstration purpose. New users can view these applications and learn configurations. Each Application have their Logo, Name of the App and platform icons so that user can have quick view of the demo App. 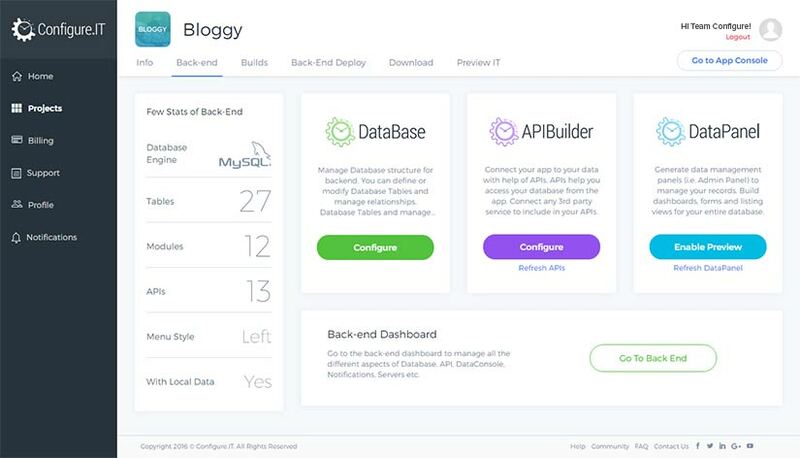 Clicking on “App Console” will redirect user to view front end configurations whereas clicking on “Backend” will show database and API related configurations. User can’t change any configurations as Demo Apps are just for viewing purpose. When the list of projects gets longer, user can archive the App which is either on hold or is not useful at the moment. Any Archived project can be retrieved anytime by just clicking a button “Unarchive” by hovering mouse over the project name. Once restored App, becomes Active App and gets listed under “My Projects” head. All the information related to payment, billing, invoices etc will be accessible from this section. This provides summary of current subscribed plan. Your Current Plan: The existing plan which you have subscribed is described under this head with the option to upgrade. Add-ons/Extensions: Top up your package or plan with additional feature or extension like Source Code download, additional project, extra developer license etc as per your requirement. Please visit http://www.configure.it/compare-packages to get more information about available Add-ons. Billing Cycle: This shows billing cycle related information like next bill amount, due date, Credit Card information, Billing interval and auto-renewal option. Along with the screenshot of the latest invoice, it gives information like invoice number, description, amount, discount, credit balance etc. All earlier invoices are listed on the left hand side to be viewed anytime by clicking on its short description. Any invoice can be either be downloaded in PDF format or be printed. Both the options are available on top right corner. 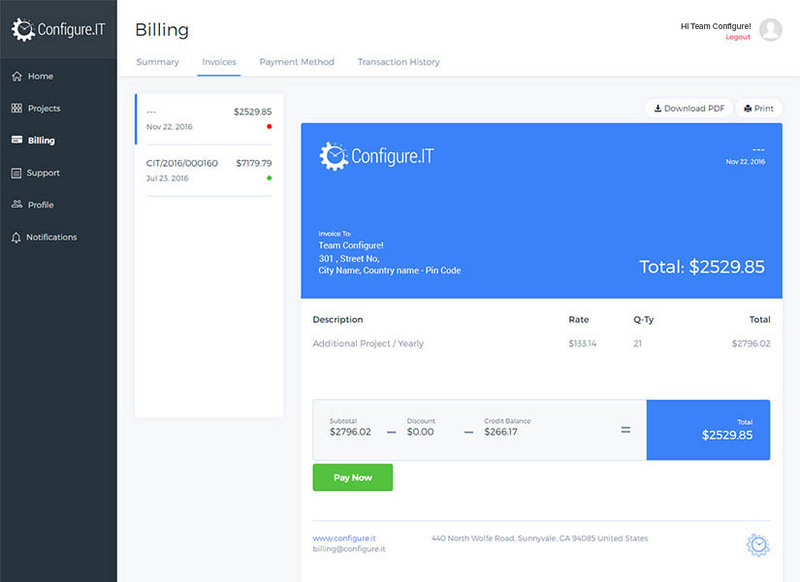 Existing payment method used for subscribing Configure.IT is shown here with all information hidden except last 4 digits of the Credit Card Number. There can be number of payment methods listed there. One of them which is used last, will be marked as the Active Method. User can always add new Payment Method by clicking on “Add New Payment Method”. This lists all the transactions till now with date, Transaction Type, Amount and Status from to latest to oldest. Support is the place where you can open a New Ticket with the issues/queries you have.. We promise to get back to you with the solution as soon as possible. This page will also give you the list of the Tickets with the Status of the Tickets. Tickets can be filtered by project and the display list shows date of creation and subject to get the overview. All user details are here at one place. This shall include Basic Info, Contact Info and some more additional Info. Here you can also upload your best photograph. We always encourage our user to provide some additional information to know you better. Based on the information provided, we would be able to provide you tailored mails as well as customized suggestions, videos for technical solution and help in the best possible manner. Any Notification or Alert from Configure.IT like Webinar or Due payment will be shown under this head.